Ian Goldin’s book The Butterfly Defect, co-authored with Mike Mariathasan, was published by Princeton University Press in May 2014. Global hyperconnectivity and increased system integration have led to vast benefits, including worldwide growth in incomes, education, innovation, and technology. But rapid globalization has also created concerns because the repercussions of local events now cascade over national borders and the fallout of financial meltdowns and environmental disasters affects everyone. The Butterfly Defect addresses the widening gap between systemic risks and their effective management. It shows how the new dynamics of turbo-charged globalization has the potential and power to destabilize our societies. Drawing on the latest insights from a wide variety of disciplines, Ian Goldin and Mike Mariathasan provide practical guidance for how governments, businesses, and individuals can better manage risk in our contemporary world. Goldin and Mariathasan assert that the current complexities of globalization will not be sustainable as surprises become more frequent and have widespread impacts. The recent financial crisis exemplifies the new form of systemic risk that will characterize the coming decades, and the authors provide the first framework for understanding how such risk will function in the twenty-first century. Goldin and Mariathasan demonstrate that systemic risk issues are now endemic everywhere–in supply chains, pandemics, infrastructure, ecology and climate change, economics, and politics. Unless we are better able to address these concerns, they will lead to greater protectionism, xenophobia, nationalism, and, inevitably, deglobalization, rising conflict, and slower growth. The Butterfly Defect shows that mitigating uncertainty and systemic risk in an interconnected world is an essential task for our future. In a Q&A for the Princeton University Press blog, Professor Goldin explains his motivations for writing The Butterfly Defect and why the book is an essential read for anyone concerned about the future of our planet. Why did you write The Butterfly Defect? I wrote The Butterfly Defect, together with Mike Mariathasan, as I believe that globalisation, by which I mean the growing openness and integration of societies, is a force for immense good. But, it also causes great harm. Unless we are able to mitigate the negative factors and harvest the positive elements more effectively, it will lead to growing instability and disastrous outcomes. This is the last of my series of four books on globalisation. The previous three identified the factors that could lead to better management and policies (Globalization for Development: Meeting New Challenges;Exceptional People: How migration shaped our world and will define our future; and Divided Nations: Why global governance is failing, and what we can do about it. The Butterfly Defect focuses on the systemic risks being generated by globalisation. These threaten to unravel the progress made to date and lead to the rejection of integration and globalisation. Rising protectionism, zenophobia, nationalism and other symptoms of the desire to reduce interdependence are manifestations of the concerns that citizens and politicians have that globalisation is not working and that the risks associated with integration outweigh the benefits. The book identifies ways to manage and mitigate the risks. The financial crisis represents a watershed in history. It is the first of a new type of systemic crisis which will characterise the 21st century. The four key failures which gave rise to the crisis are present in many other areas. Unless we can manage the new forms of systemic risk more effectively it will lead to growing global instability. Although the rising threat posed by pandemics, cyber attacks, widening inequality and political fracturing, environmental collapse and climate change, infrastructure weaknesses and supply chain disruptions and other systemic risks appear unrelated, they have the same underlying causes and solutions. These are: accelerating integration and interdependency as a result of economic and political opening and new technological platforms; growing complexity and an inability to discern cause and effect in the blizzard of big data; technological revolutions leaping ahead of evolutionary institutional reforms; and, the growing gap between local management by divided nations of global and regional processes and systems. The book is the first to identify systemic risks as being an endemic feature of globalisation. It stresses that globalisation has been the most powerful force for improvements in living standards around the world, but the engine of progress has also unleashed dangerous and potentially destabilising forces which could not only arrest the progress made, but lead to instability and reversals. The book provides perspectives on how we can manage growing integration and complexity. It is unique in the breadth and depth of its analysis. It builds a bridge between the cutting edge of academic knowledge and the worlds of business and policy. The book has been written for the widest possible audience. It is rooted in scholarly research and provides a great deal of evidence and analysis of the theory. However, the language is accessible and I have worked hard to reduce jargon and to avoid equations and writing that cannot be widely understood. My aim has been to write a book that will be read by students, business people, policy makers and anyone concerned with a sustainable future for our planet. 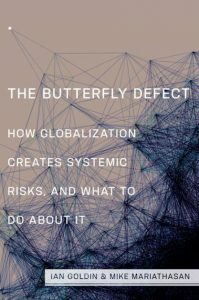 How did you come up with the title, The Butterfly Defect: How Globalization Creates Systemic Risks, and What to Do about It? The title arose in a discussion with a student at Oxford who was engaged as a research assistant for the book. It is a play on the concept of the butterfly effect, which is well known in complexity theory and physics, with the replacement of ‘effect’ by ‘defect’ seeking to highlight the risks associated with a highly interconnected world. The subtitle tells readers what the book is about and highlights the fact that The Butterfly Defect goes beyond identifying the issues to provide practical lessons and tools to manage the systemic risks which globalization creates. On 3 February 2015, Professor Goldin gave alecture at the London School of Economics.